1. What is the difference between type 1 and type 2 diabetes? The difference does not rely on the blood sugar levels but in the amount of insulin produced/secreted. 2. I am happy to know that you have been controlling your blood sugar (bs) greatly, and you succeeded to bring your bs as low as 6.5. I hope you will continue this way. Now, alcohol can influence bs, especially if you are taking medications. I strongly advise not to use alcohol when you take hypoglycemiant drugs as it might precipitate hypoglycemia. Some of my patients have ended up in ICU due to severe hypoglycemia after consuming alcohol (hypoglycemic coma). Keep on your good job of controlling bs. Hopefully, you won't have further problems. If you have other comments, do not hesitate to write me back! I have been undergoing a lot of stress lately due to work condition and I am using herbs to help reduce my blood but it seems as if Myne cant be controlled and I'm also using Novomix 30 in the morning and 15 in the evening, please advise which herb really do work? I can understand that you are using insulin to control your blood sugar levels. It is important to follow a healthy diet and lifestyle regimen apart using medications. 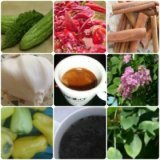 With regards to herbs for diabetes, my suggestions are based on clinical trials. However, I can admit that it all depends on individual experience. Among the herbs, banaba, fenugreek, gymnema sylvestre are among the herbs most commonly used. It is also important to use vitamins and minerals along with herbs as diabetics are often lacking them. At the end, it is important to consult with your physician and/or dietitian for more specific advice based on your medical data that I lack.